Wouldn’t you like to be paid for what you already know? Alexander Saint-Amand, shares how he built his company by creating one-on-one connections between people with specific expertise and those who want to pay them for it. 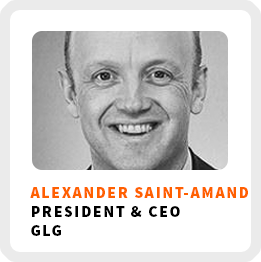 Alexander is the president and CEO of GLG, a company that scales 1-on-1 learning through conversations. Think of it as Uber for getting expertise in specific knowledge areas. He wants you to get paid for what you know! How Alexander has applied specialization to learning by tailoring the experience for what different clients need. Starting GLG as a project within another business and trying multiple routes of growing the learning business. The value of starting out in the business without investors and how they maintained their vision after bringing investors in later. Become a better teacher by becoming a better learner. Why you are more likely to make a big decision after a conversation and not by reading a book. Core work activities + habits: 1) Build and manage a great team. 2) Prioritize the right things. Ideal work environment: Preferably in one-on-one settings or a small group of people; in the office, physically with the people that he’s working with. Regains focus by: Practicing yoga. 90-day goal: Dig more into the broader applications of their idea. Start with what you love. Think about your favorite parts of your job and what knowledge they involve.